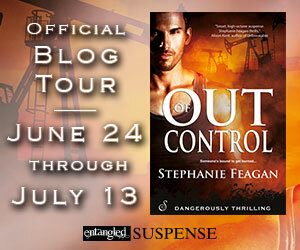 The Out of Control blog tour kicks off today! Stop by for interviews, guest posts and a giveaway for $25 gift cards to Amazon and Barnes & Noble. 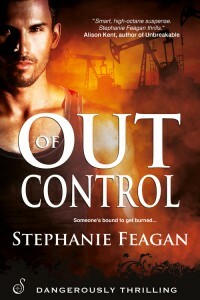 Oil rig blowout specialist Blair Drake is finished with men—especially after her disastrous marriage that caused her family to disinherit and cut all ties with her. But when Nick Robichaud, a handsome, roguishly charming oil well fire expert, wildcats into her life, throwing his devil-may-care attitude all over the place, the real sparks begin to fly. Forced to work together to kill a string of sabotaged oil rig explosions, Nick and Blair discover a plot to cripple the world’s oil supply. Unless they stop the doers, it’ll mean global economic catastrophe. With time running out and their lives on the line, they risk everything to prevent disaster. But nothing can stop the fire between them from burning out of control….